Typically, polyphonic music is seen as having developed from a set of fixed rules and almost mechanical practice. This changes how we understand that development precisely because whoever wrote it was breaking those rules. The piece is technically known as an “organum”, an early type of polyphonic music based on plainsong, in which an accompaniment was sung above or below the melody. 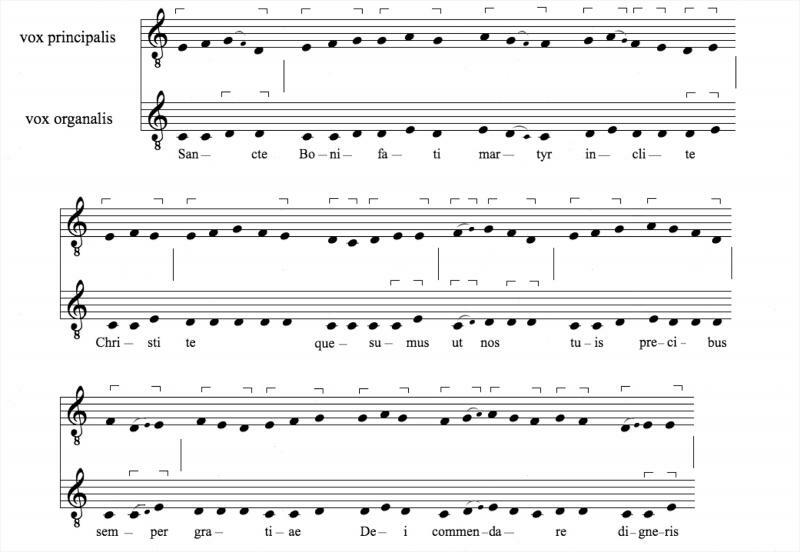 Who wrote the music, and which monastic house it came from, remains a mystery, but through meticulous detective work Varelli has been able to pin its likely origins down to one of a number of ecclesiastical centres in what is now north-west Germany, somewhere around Paderborn or Düsseldorf. This is partly because the type of plainchant notation – sometimes known as Eastern Palaeofrankish – was most used in Germany at that time. In addition, however, an unknown scribe had added a Latin inscription at the top of the page which when translated reads: “which is celebrated on December 1”. This odd comment, a reference to the Saint’s Day for Maternianus, alludes to the fact that unlike most monastic houses, which celebrated Maternianus on April 30, a handful of communities in north-western Germany did so on December 1. Combined with the notation itself, this makes it likely that whoever wrote the music was based in that region. “The music was added some time after the main saint’s life was written,” Varelli added. “The main text was written at the beginning of the 10th century, and on this basis, we can conservatively estimate that this addition was made some time in the very first decades of the same century”. The video shows the piece being performed by Quintin Beer (left) and John Clapham (right), both music undergraduates at St John’s College, University of Cambridge. The music was written around the year 900, and represents the earliest example of polyphonic music intended for practical use. Credit: MS Harley 3019. Reproduced with the permission of the British Library Board.